McMaster University football player Jerimiah Brown came to Elk Lake in 2009, and without ever previously having picked up an oar, transferred his physical abilities from the field to the water. He ended up winning a silver medal in rowing at the 2012 London Summer Olympics. Bobsleds have carried athletes from rugby and track and field to the Winter Games. The search is on today at the University of Victoria, in the CARSA Gymnasium, for the next Canadian cross-over sports Olympians. The RBC Training Ground national athlete identification program puts hopefuls from any sporting background, between the ages of 14 and 25, through their paces to measure speed, strength, stamina and power. Pre-registration has been strong online. Same-day registration is at the door from 8 a.m. to 10 a.m., with testing running to 1:30 p.m. There is no charge. Officials from various national organizations, representing 11 Olympic sports, will gauge the hopefuls’ physical metrics, to see which might translate to potential success in a particular sport the athlete might not have previously considered. Organizations with representatives on site will include Rowing Canada, Canoe-Kayak Canada, Triathlon Canada, Cycling Canada, Athletics Canada, Rugby Canada, Water Polo Canada, Judo Canada, Bobsleigh Canada and Alpine Canada. 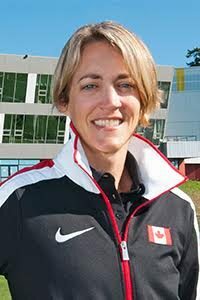 Mentors on hand to provide inspiration and support will include two-time Olympic medallist swimmer Ryan Cochrane of Victoria and Elk Lake rower Will Dean, the latter a basketball player who came later in life to rowing and became a two-time Olympian, not under the basket, but on the water with an oar. Dean had graduated as a basketball star with the Kelowna Secondary Owls and was looking into playing B.C. college hoops when he decided to work out on a stationary rowing machine called an ERG. He was good at it and someone suggested he enter the annual Monster ERG national competition held at UVic’s McKinnon Gym. Dean’s ERG scores jumped out of the gym, and that fall, he was rowing in the NCAA Pac-12 for Cal-Berkeley. “Some people’s physiology is better suited for another sport. And you can have success crossing over from your old sport and starting that new sport later,” Dean said. Dean, 29, has qualified twice for the Summer Games on the water and is looking for the three-peat in 2020 at Tokyo. “I really believe in this [RBC Training Ground]. It’s a great program and it’s fun to do. It formalizes the process of identifying athletes and channelling them to sports of which they might not be aware,” said Dean, also a double gold medallist in the Pan Am Games. This is the fifth and final stop on this year’s B.C. tour, after similar tryouts held in Burnaby, Langley, Kamloops and Prince George. This version of the program began in 2016, out of which have come 25 athletes identified as showing enough to warrant funding and support through RBC and the Canadian Olympic Foundation. The genesis locally was in 2012 with a Canadian Sport Institute Pacific program called Podium Search conducted by Olympic-medallist rower Barney Williams at PISE. That initiative has now been folded into the national RBC Training Ground.